Ever since Fidel Castro assumed power in Cuba in 1959, Americans have obsessed about the nation ninety miles south of the Florida Keys. America's fixation on the tropical socialist republic has only grown over the years, fueled in part by successive waves of Cuban immigration and Castro's larger-than-life persona. Cubans are now a major ethnic group in Florida, and the exile community is so powerful that every American president has curried favor with it. 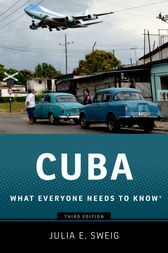 But what do most Americans really know about Cuba itself?In this third edition of the widely hailed Cuba: What Everyone Needs to Know®, Julia Sweig updates her concise and remarkably accessible portrait of the small island nation. This edition contains a new foreword that discusses developments since Obama and Raul Castro announced the normalization of US-Cuba relations and restored formal diplomatic ties. A new final chapter discusses how normalization came to pass and covers Pope Francis' visit to Cuba, where he met with Fidel and Raul Castro. Expansive in coverage and authoritative in scope, the book looks back over Cuba's history since the Spanish American War before shifting to recent times. Focusing equally on Cuba's role in world affairs and its own social and political transformations, Sweig divides the book chronologically into the pre-Fidel era, the period between the 1959 revolution and the fall of the Soviet Union, the post-Cold War era, and -- finally -- the post-Fidel era.Informative, pithy, and lucidly written, it is the best compact reference on Cuba's internal politics, its often fraught relationship with the United States, and its shifting relationship with the global community.What Everyone Needs to Know® is a registered trademark of Oxford University Press. Julia E. Sweig is Senior Research Fellow at the Lyndon B. Johnson School of Public Affairs at The University of Texas at Austin. She is the award-winning author of several other books, including Inside the Cuban Revolution: Fidel Castro and the Urban Underground, for which she won the American Historical Association Herbert Feis Award for best book of the year by an independent scholar. She has been traveling to and writing about Cuba since 1984. She lives with her family outside of Washington, DC.